There are times, however, when projects can only be completed on Forest Preserve lands. 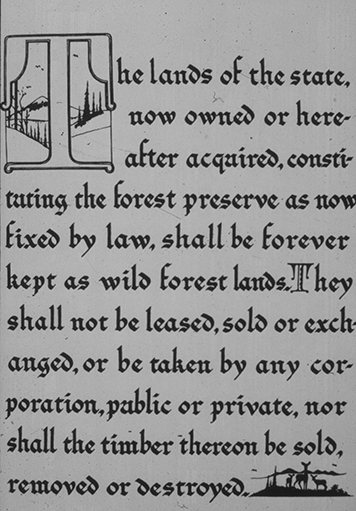 Because the Forest Preserve is constitutionally protected, amendments to Article XIV must be adopted to allow those projects to go forward. Passing a constitutional amendment is a serious undertaking. First, the amendment must be introduced by sponsors in both the New York State Senate and Assembly. Like the introduction of a regular bill, the amendment is assigned a bill number and it is sent to the appropriate committees in each house. In addition to committee review, an amendment is also referred to the state Attorney General, who within 20 days, must provide an opinion in writing to the Assembly and the Senate on how the amendment will affect the state Constitution. This opinion is advisory and one or both houses may take up the amendment for a vote prior to receiving the opinion. Once released from committees, the amendment moves to the floor of each house for a vote. Identical versions of the amendment must be passed in each house. Unlike a regular piece of legislation, after the amendment is passed, it does not go to the Governor for his signature. Instead, it is referred to the next regular two-year legislative session which follows each of the general election of the members of the Legislature. Following second passage of the amendment by the newly elected Legislature, it is placed on the ballot for a statewide voter referendum. Once the amendment is approved by the majority of voters in the state, it is incorporated into the NYS Constitution. Often the amendment will then be sent back to the Legislature so that they can pass implementing legislation to outline how the amendment will be carried out. The implementing legislation could impose further environmental or procedural controls over the project.